Abu Dhabi’s Etihad Airways is changing the aircraft it uses to serve two U.S. destinations. Currently, Etihad Airways operates leased Jet Airways Boeing 777-300ERs or its daily round-trip linking its hub at Abu Dhabi International Airport with San Francisco. 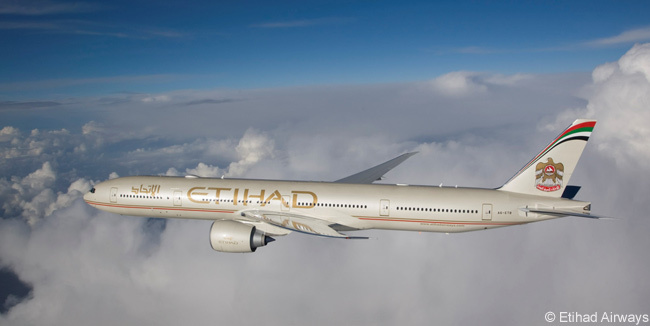 Etihad Airways will replace the Jet Airways 777-300ERs with its own Boeing 777-200LRs on the route from April 25. Additionally, from June 1 the daily EY101 flight from Abu Dhabi to New York’s JFK airport and the return EY100 service will also see leased Jet Airways Boeing 777-300ERs replaced by Etihad Airways’ own aircraft. In this case, Etihad Airways will replace the leased 777-300ERs on the route with its own Boeing 777-300ERs. Etihad Airways will continue to operate its second daily service to and from New York JFK, flights EY103 and EY102, with Airbus A380s. The Boeing 777-200LRs which Etihad Airways will operate on the Abu Dhabi-San Francisco route are configured to carry 239 passengers in three cabins, with eight First Class seats, 40 Business Class seats and 191 Economy Class seats. Etihad Airways’ Boeing 777-300ERs on the Abu Dhabi-New York route are configured to carry 328 passengers, also in three cabins. Each has eight First Class seats, 40 Business Class seats, and 280 Economy Class seats. All Etihad Airways passengers flying to the United States pass through U.S. customs and immigration pre-clearance at Abu Dhabi International Airport. This means they clear U.S. immigration and customs checks before boarding their flight and they arrive in America as domestic passengers. Etihad Airways currently operates twice-daily service to New York JFK, a daily service to Chicago, a daily flight to Washington Dulles International Airport, a daily round-trip to Los Angeles, a daily service to San Francisco and three flights a week to Dallas-Fort Worth.